Right now, there are more than 5,000 Palestinians in Israeli jails, including 183 children. Human rights organisations have documented widespread torture, including of children, and Palestinians are often held without trial indefinitely. In June 2013, the Bill and Melinda Gates Foundation, the largest private foundation in the world, purchased shares in G4S worth $172m, making it one of the company’s biggest shareholders. Through its holdings in G4S, the Gates Foundation is legitimising and profiting from Israel’s use of torture, mass incarceration and arbitrary arrest to discourage Palestinians from opposing Israel’s apartheid policies. 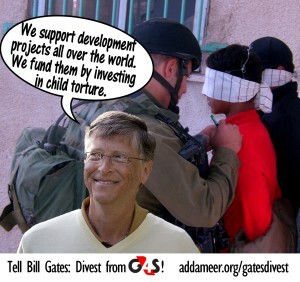 Sign the petition now: Tell Bill Gates to divest from G4S!